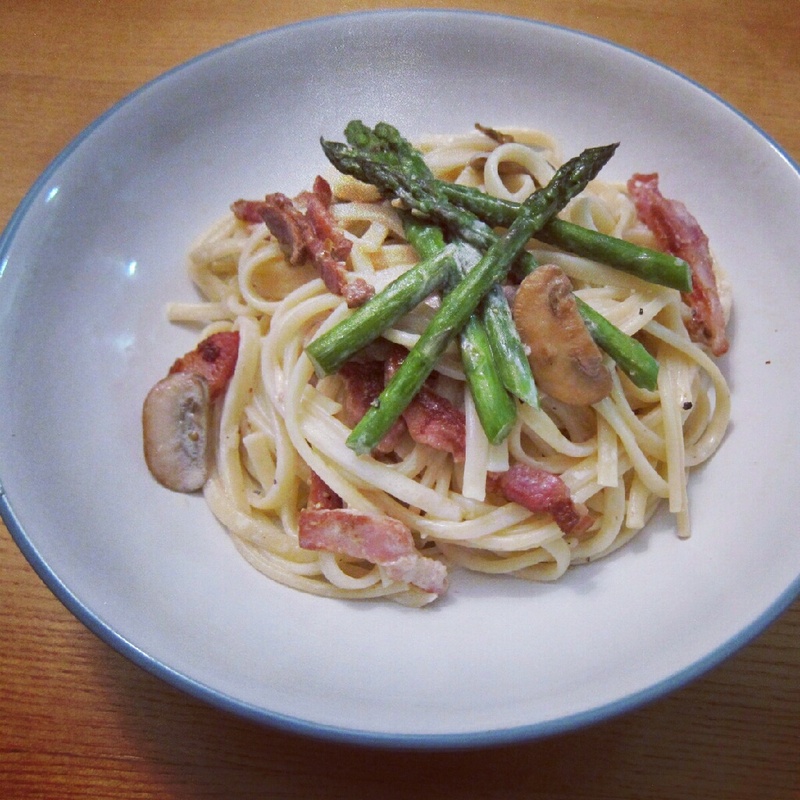 Well I’ve taken inspiration from that very clever individual to whip up a very quick spaghetti dish, Spaghetti with Bacon, Asparagus and Mushroom. Short of buying a packet of ready-made cream sauce, I tried making this using single cream instead of whisking a combination of eggs and cheese for the sauce. Lazy of me yes, but some days after work I just want quick and easy, you know what I mean? This makes for an easy and relatively inexpensive meal, and funnily enough the most expensive item in this dish would be the asparagus even though asparagus is a plant that actually grows very quickly. Something I learned after going out to Medley Manor Farm here in Oxford over the summer (for strawberry picking!) and was talking with the guy manning the asparagus booth who said that asparagus, in optimal warm conditions, grows up to 20 cm a day! That’s almost 1 cm an hour! He said that they’ll harvest it in the morning, take a break, then come back at noon to hack the asparagus stems down again. For such a fertile plant, asparagus sure is expensive and is marketed as a luxury foodstuff, though I guess it might be in limited supply because it only grows during the summer (the rest of the year it is left to grow into a very woody, tall hedge). Here is the ‘recipe’, though please take my measurements of the quantity of cream with a pinch of salt — haha literally, too. 1. Boil a pot of salted water. Curl in spaghetti when water has come to a boil. 2. In the meantime, heat a frying pan on medium heat. When making this dish I didn’t add extra oil as a lot of oil will be rendered from the bacon! Add in diced bacon, cooking both sides evenly so that it is crispy. 3. When bacon is done, set aside on a plate with paper towels to absorb excess oil. 4. Using the leftover oil in the frying pan, stir fry garlic, mushrooms, and asparagus. Lower heat to low-medium heat. Add a little water to the pan and cover the pan with a lid to gently steam the mushrooms and asparagus (this will soften the veggies). Do this for half a minute. 5. When spaghetti is almost cooked (should take about 9 to 11 minutes), add your crispy bacon back to the pan, drain the spaghetti (try to retain some of the hot pasta water), and then slide spaghetti into the pan as well. Mix spaghetti with the rest of the ingredients. 6. Add in single cream, mixing in hot pasta water so that you create a nice sauce to coat all of the pasta. 7. Dash salt and crack freshly ground black pepper over the pasta.